This is a manual for working with the DynaPort MT. It is recommended to follow the steps in this manual prior to the first measurement to familiarize yourself with the device and its settings. With the index on the left hand side of this page you can quickly navigate to the chapter of interest. The manual for working with the DynaPort Hybrid (Serial numbers H2xxx) can be found here. Preparing the DynaPort MT before first use consists of two parts. First, your computer and the DynaPort MT need to be coupled via Bluetooth and second, a connection between the DynaPort MT and the My McRoberts web portal needs to be established. Make sure your computer has Bluetooth functionality before these steps are performed. 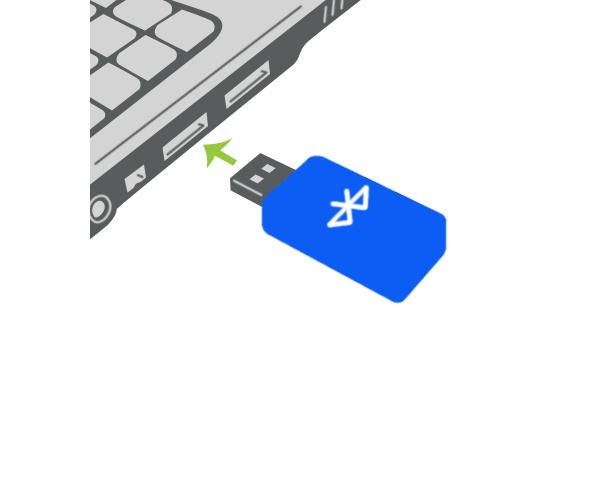 You can use an external Bluetooth dongle when your computer doesn’t have internal Bluetooth functionality. please make sure sure that this is a ‘class 1’ dongle, so longer distances can be covered. Also make sure that your dongle is compatible with Bluetooth v2.1 (i.e. it should be backwards compatible). The following process needs to be performed once for every DynaPort MT that you use. The process can vary depending on your Windows version and the installed Bluetooth stack. Here the process is described for a computer with Windows 7 and Microsoft Bluetooth stack. Bluetooth consumes relatively large quantities of energy. Therefore, the Bluetooth component is configured in such a way that it will only go on when you move the device (i.e. when it is in use). When the DynaPort MT remains untouched for a few minutes, the Bluetooth will turn off automatically. 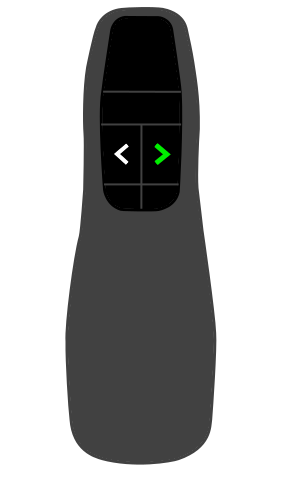 Turn the DynaPort MT around 1 or 2 times in order to activate the internal Bluetooth. The blue LED starts blinking. Hereafter, the device is detectable for the computer. Double click on the Bluetooth icon in the notification area. All Bluetooth devices are shown in the window that pops up. To add your DynaPort MT click on Add device. The serial number of the DynaPort MT is on the sticker that is on your DynaPort MT. Select your DynaPort MT from the list and click ‘Next’. You will be asked for a code. Type 1234 and click ‘Next’. Then click ‘Close’. Note, sometimes a code is shown with the question if it matches the code on the device. In this case, select ‘yes’ and click ‘Next’. Click ‘Close’. The connection process may take a few minutes. My McRoberts will display a connection error if the connection has not yet been established. Your DynaPort MT will be shown in the list of Bluetooth devices. The DynaPort MT can be controlled from the website https://www.mcroberts.nl/mymcroberts. All steps, from performing a measurement to viewing the reports take place here. After your first login, a pop-up will appear with the request to download a small software package. Download this software in order to establish a connection between your DynaPort MT device(s) and the software on My Mcroberts. Please follow the wizard to install the software. This software must be installed on each computer that you use the DynaPort MT on. It is important to charge the DynaPort MT to ensure maximal measurement capacity. If the battery runs empty during the measurement, the measurement will prematurely stop. The device can be charged by connecting it to a computer with the supplied USB cable. 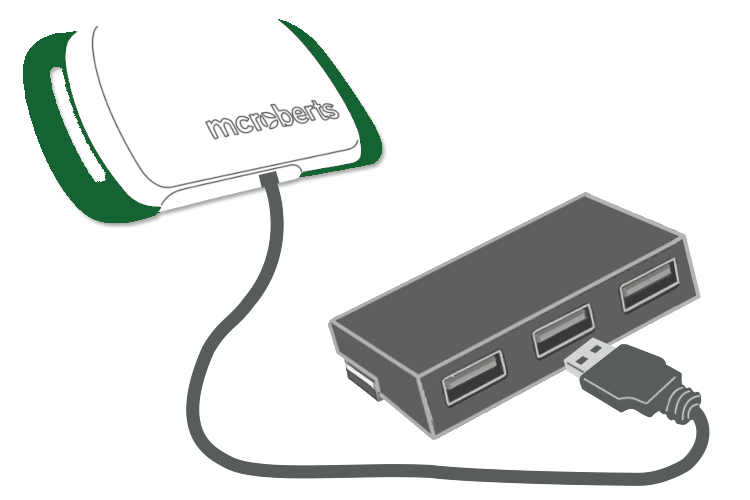 Multiple devices can be charged at once by using a powered USB-hub. Charging takes up to 5 hours. The Green LED gives information about the charging status while the DynaPort MT is connected via USB. When the green LED is blinking the device is charging and when the green LED burns constantly the device is fully charged. The Blue LED provides insight in the DynaPort MT’s Bluetooth connection. Blinking means that the Bluetooth component is active and that the device is detectable for the computer. Constant burning means that there is an active connection between the DynaPort MT and the My McRoberts portal. In order to measure, the DynaPort MT needs to be programmed. 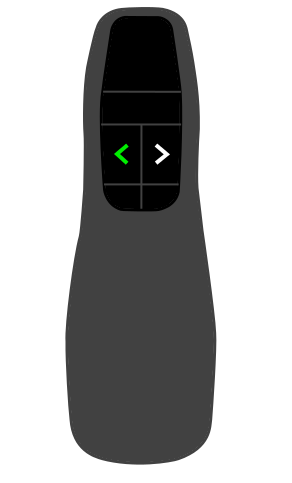 From this moment on you should no longer use USB connection between the DynaPort MT and the computer; use the Bluetooth connection only. A dark green information tile will appear in the Devices tab for each connected DynaPort MT. The tile displays the device number (lower left corner), the battery status (upper left corner), and how it is connected, either via USB, Bluetooth or both (upper right corner). Click on a tile (device) to start a new measurement with that device. You can also directly select the Measure tab to do this. You need to select the DynaPort MT that you want to use from the drop-down menu if you choose the latter option. Add or select a project, subject and visit in order to start a measurement. Using different projects is useful for organizing your data. Subject characteristics have to be added for each new subject. Visits refer to different measuring moments. If there is only one measuring moment (visit), fill in a random number as visit number and in the future this visit number will appear as a default setting. Click on the ‘Select protocol’ button. If an old measurement is found on the device, it should be ‘formatted’ first. The protocol that you want to use for a measurement can be selected from the appearing drop-down menu. Only the generic protocol will be available if you do not make use of customized protocols. Please contact sales@mcroberts.nl for information about customized protocols. When a protocol is selected, a measurement interface for performing the measurements will be created in accordance with the selected protocol. Attach the DynaPort MT to your subject before you proceed with measuring. The device should be worn around the waist, at the middle of the lower back. The engraved McRoberts logo should be readable and the waist belt should be on the inside. It can be worn directly on the skin or over a layer of clothes. Click on the ‘Start recording’ button to start the Bluetooth communication between My McRoberts and the DynaPort MT. This will take a few moments. Hereafter, the marker buttons are enabled and an arrow will point to the active event marker button. The blue LED will burn constantly while measuring and the green light will blink. It is recommended to read the paragraph How to perform a MoveTest prior to collecting data. This short manual provides instructions on how to prevent errors in the analysis due to the execution and marking of the tests. Different event markers can be sent to the DynaPort MT by mouse clicking the event marker-buttons that are now enabled or by using the keyboard keys. Event marker buttons are designed to mark the beginning and end of named intervals in the measured signal. 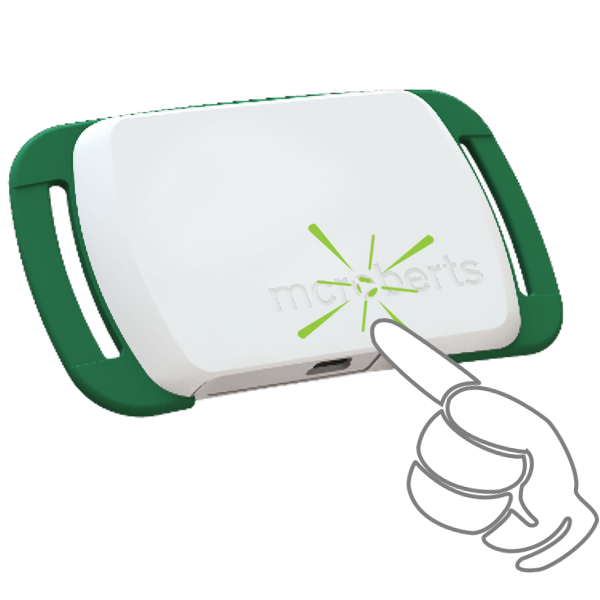 They can also be set remotely with a Wireless Presenter. An auditive signal is provided when each marker is set. The next paragraph will explain how to do this. 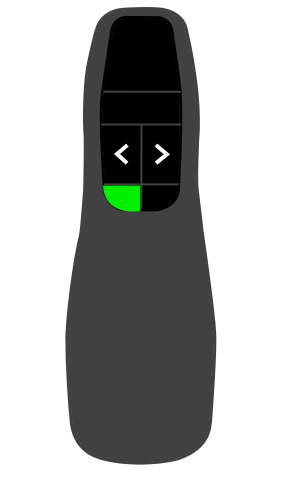 green: Marker-button is active, measurement is currently not being performed. dark green: A task is currently performed. Use the same marker button to mark the end of the task. faded green: The button is disabled and cannot be used. If a trial fails or if you accidentally place a start marker, you can delete this with the cancel button. Click Stop recording when all tests have been performed and the measurement is finished. Starting and stopping tests can also be performed remotely with a Wireless Presenter, instead of by mouse-clicking or by using the keyboard. This way you can freely move around the room -within the vicinity of the computer- and assist or instruct your subject. We recommend to use this presenter because of its operating distance and stable connection. With the right arrow button on the presenter you can start/stop the test items (setting markers). With the left arrow button you can cancel a test where after you can start it again with the right arrow button. The F5/esc or ‘start presentation’button can be used to skip tests in the protocol when they cannot be performed for some reason. The collected data needs to be uploaded to My McRoberts after measuring. After a succesful upload one or multiple reports of the measurement will be generated, depending on the software modules you have purchased. 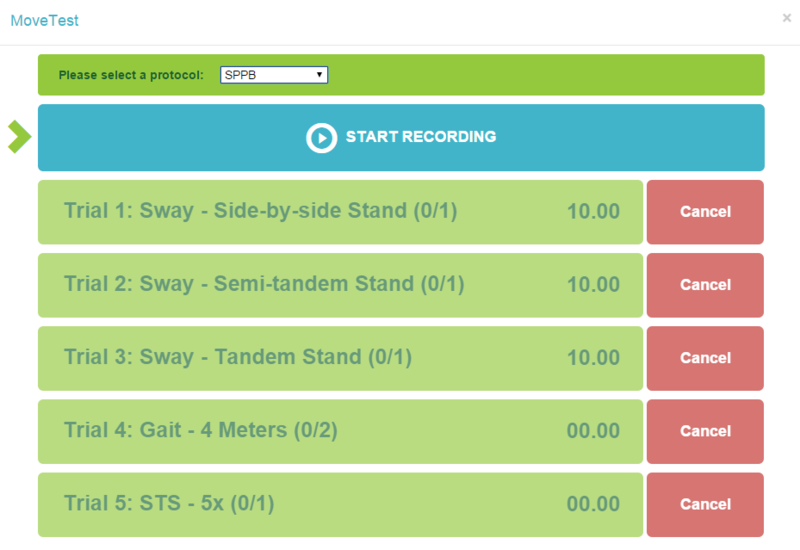 A log file of the marked intervals will be displayed when you click the Stop recording button. A .csv export of this information is optionally available. 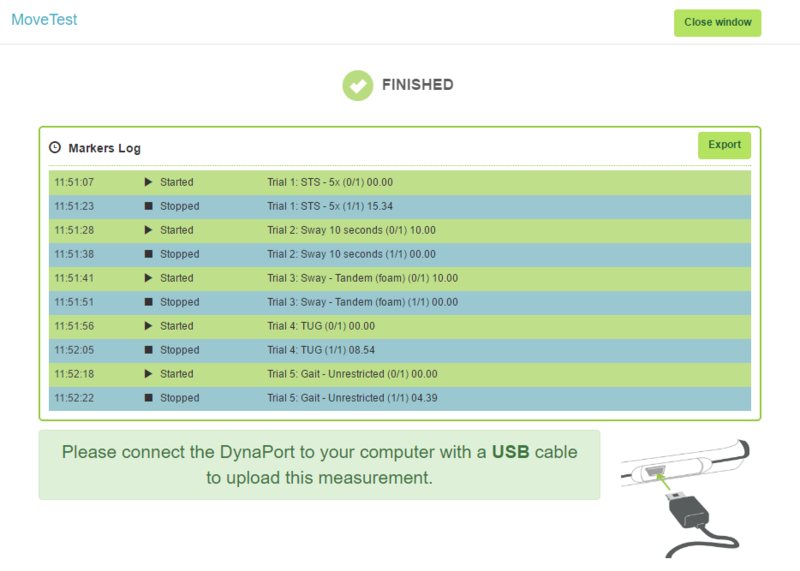 Connect the DynaPort MT to your computer with the USB cable to start the upload process of this measurement. 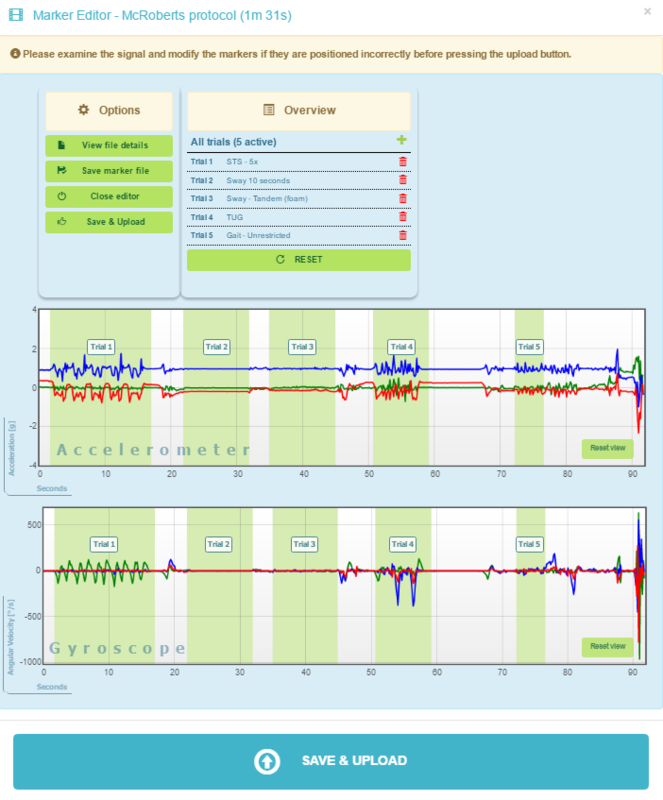 The McRoberts analysis software searches for start and stop markers that enclose a trial which were set during the performance of the test. Only data within markers will be analysed. Therefore, the start and end of a trial should be well within the marked interval to ensure that the measurement is analysed properly. Please see the chapter How to perform a MoveTest for tips and tricks. An overview of the marked trials is displayed in the overview panel. The names of the trials match the names on the buttons in the used protocol. Marked intervals can be deleted using the icon and new intervals can be added by clicking the icon. 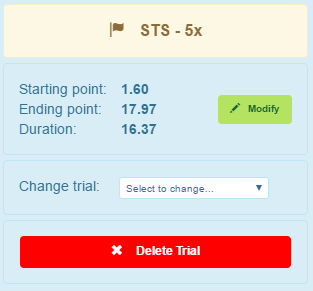 To add a new trial interval you need to click in one of raw data planes and drag a selection. The newly marked trial will then appear in the overview panel. Click on a light green plane in the data to edit that particular trial. Its color will change to orange and a panel with the trial name will appear in the upper right corner. Choose ‘modify’ to select a new interval or change the trial name if need be. Deleting the trial is also a possibility. Use the reset button in the overview panel to undo all made changes. Changes to individual trials are made undone by clicking the icon. Please delete, add or edit the intervals that mark your trials to prevent errors during the analysis of the data. Confirm that all events are marked correctly bij clicking the Save & Upload button. Data will then be uploaded to one of our cloud servers for analysis. All information about currently performing and performed measurements is visible in the tab ‘Data’. Managing your data and viewing/downloading results takes place here. The following overview of measurement statuses is presented to you when you click the on ‘overview’ button on the left-hand side of the screen. This overview is shown by default when you click on the tab ‘Data’. With the ‘Configure filter’ button you can set the filter settings in order for you to only see the statuses of the measurements you are interested in. Click on a status to view the individual measurements belonging to that status. The number in each status tab shows how many measurements have that particular status. Each measurement status will be explained below. Measurements that have been performed but were not yet uploaded to the McRoberts servers are shown here. When this is the case for a measurement you have to couple the DynaPort MT where the measurement is on to your PC to start the upload process. Measurements that have just been uploaded are displayed under the ‘Analysing’ tab until the analysis of this measurement is completed. When the analysis of a measurement is completed and reports are ready to be viewed, the measurement is displayed under the ‘Analysis completed’ tab. Click on a measurement to view or download the reports. All reports for which you have purchased a license are visible here. When the software fails to analyse a measurement it will be displayed under the ‘Analysis failed’ tab’. The McRoberts Support Team will be notified of such an analysis failure and will fix the problem or otherwise contact you. A measurement that is not in any of the categories above is considered “idle” and will be shown here. This is usually because you don’t have the appropriate licenses to start the analysis. However, the raw data files can be downloaded from here to analyse yourself in e.g. MATLAB. Contact McRoberts if you wish to use our dedicated analysis software. Measurements can also be viewed per project. 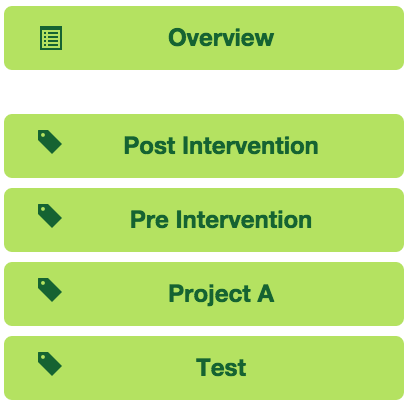 All your projects are displayed below the ‘overview’ button on the left-hand side of the screen. Click on a project to view the subjects, visits and shared users of that project. Via subjects you can navigate to the measurement(s) belonging to that subject. Raw data that is uploaded to My McRoberts -for analysis- can also be downloaded from it. All users from a certain project (see the next paragraph ‘Shared users’) can this way download raw data from My McRoberts that is collected by themselves or by any other user of that project. Contact sales@mcroberts.nl for a research toolbox to process your raw data. A project can be shared with colleagues. To do this, click on the button ‘shared users’, fill in an email address and assign ‘permissions’ to his or her for this project. Make sure that the colleague that you add already has a My McRoberts account; the email address must be recognised by My McRoberts. The first 4 permissions refer to the data. By making someone ‘Admin’ he or she has the rights to add people to and withdraw people from the project. This document provides guidelines on how to perform physical performance tests with the McRoberts MoveTest by means of some simple tips and tricks. Our analysis software is sensitive to how tests are executed. Therefore, errors in the analyses may occur when the tests are not executed in accordance with our guidelines. This document aims to standardize the execution of performance tests with the MoveTest, in order to prevent errors and increase comparability. Placement of markers in the data: Performed tests should be marked with a start and a stop marker that mark the time interval of the test. The analysis software searches for these markers before the analysis of the signal can start. Therefore, the start of the test should be well within this marked interval to ensure that it is analysed properly (see the figure below). The same accounts for the end of the test. If a trial fails or if you accidentally place a start marker, you can delete this with the cancel button. The green plane indicates the marked time interval. The left panel shows a too tightly marked Sit to Stand Test; the test started before the start marker. The right panel shows the same test but correctly marked. Bluetooth range: Devices are controlled remotely via Bluetooth, so make sure that the DynaPort MT (i.e. the subject) stays within the range of the PC and the remote control to ensure a connection throughout the test. Make sure that the subject starts the test and ends each cycle of the test with his or her back against the back of the chair. Also, after standing up, the trunk needs to be fully extended (see the figure on the right-hand side). Repeat the Sit to Stand 5 times and end with the back against the back of the chair. As with the Sit to Stand Test, the start and end of the Timed Up and Go Test (TUG Test) should be with the subjects’ back against the back of the chair. Since subjects will walk after they stand up during the TUG Test, full extension of the trunk is not an issue here. 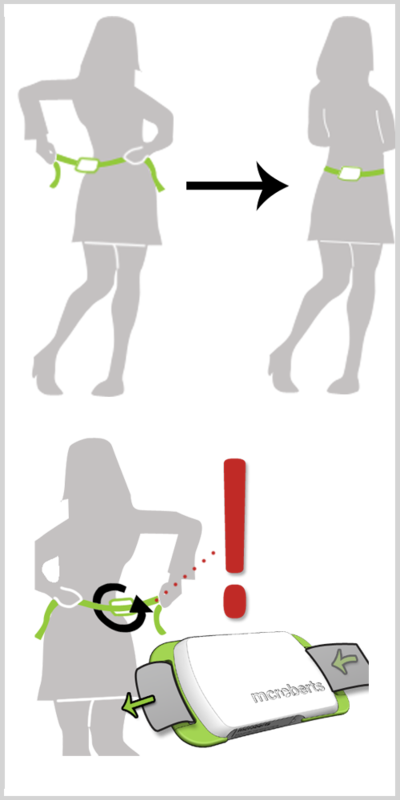 The two upper images display a correct execution of the Sit to Stand Test. The two lower images display an execution of the test that could lead to analysis errors. TUG Tests are often performed more than once in sequence (e.g. repeated trials or double tasks). The analysis software needs to recognize the different trials. So, the end of a trial and the start of a subsequent trial should not be too close to each other. To avoid this, make sure that the subject sits still for a few seconds between the trials. This also allows for correct placement of the markers, as indicated in the chapter ‘General’. This can be achieved by clearly informing the subject to wait for instructions on when to start the next trial. 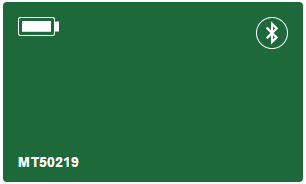 The green plane indicates the marked time interval. The left panel shows two trials with too few time between them (i.e. no clear dissociation between the end of the first trial and the start of the second trial). The right panel shows two trials with appropriate time between them. To ensure errorless analysis of the data, the setup depicted below is recommended. Ask the subject to walk back and forth between the pylons. Mark the passing of the lines of the “steady state trajectory”, using the remote control. A recommended setup for the Gait Test. The instructions below guide you in how to perform a reliable Sway Test. Stand next to the subject to help him/her into the preferred position (e.g. side-by-side, semi-tandem or tandem). Supply just enough support to the subject’s arm to prevent loss of balance. Then let go and place the first marker as you say, “Ready, begin”. The second marker is automatically placed when the programmed time has passed. Hereafter, say “Stop”. When the subject steps out of position or grabs your arm, stop the current trial. The trial will be regarded as not completed. 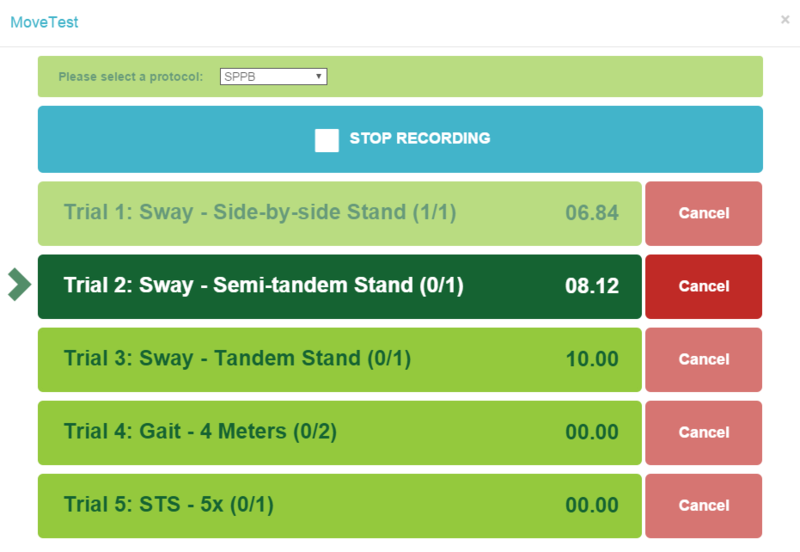 Please note that for Sway Tests, start and stop markers cannot be edited afterwards since for Sway Tests these cannot be identified visually. This test can be performed on a straight trajectory with a length between 10 and 50 meters. The software does not support rectangular or circular trajectories; there should be clear 180° turns in the trajectory. The instrumented 6-Minute Walk Test can be performed in the same way as a the non-instrumented version. This means that walking aids may be used and that intermittent resting is allowed. The test is being started by clicking the marker button or remote control button once. This will trigger the 6-minute count down. After 6 minutes the end marker will automatically be set. No markers should be placed during the performance of the test!